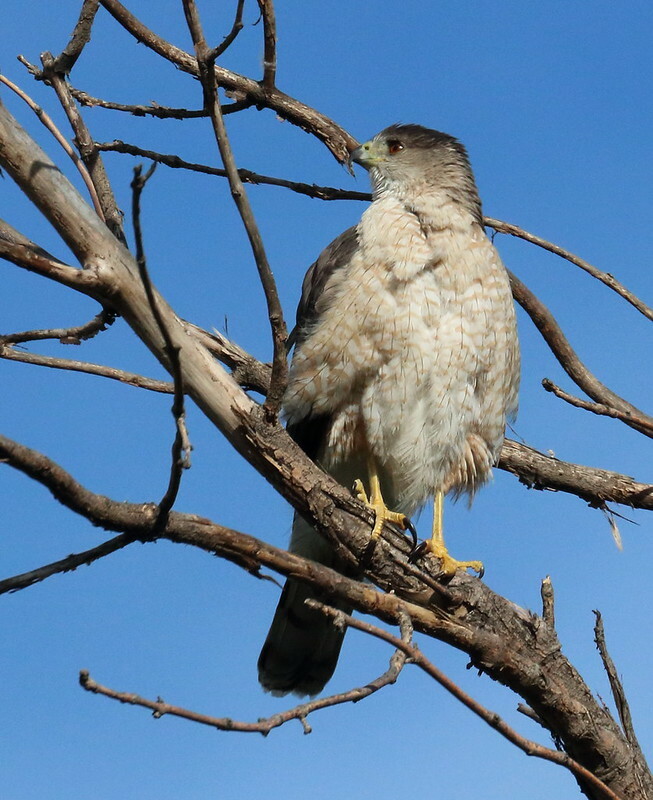 This video has got some interesting footage of a juvenile Coopers hawk bathing. Dec 12 - I again had a brief sighting of an adult Coopers today, flying overhead a couple of streets north of the park. Dec 16 - on my way back from xmas bird count, I had a brief sighting of an adult around 5pm a couple of blocks S of the park flying across the road between some industrial buildings, maybe looking for pigeons. Dec 25 - around 11am I spotted a Coopers roosting on a light standard beside the road about 50m N of the church (a main block N of the park). 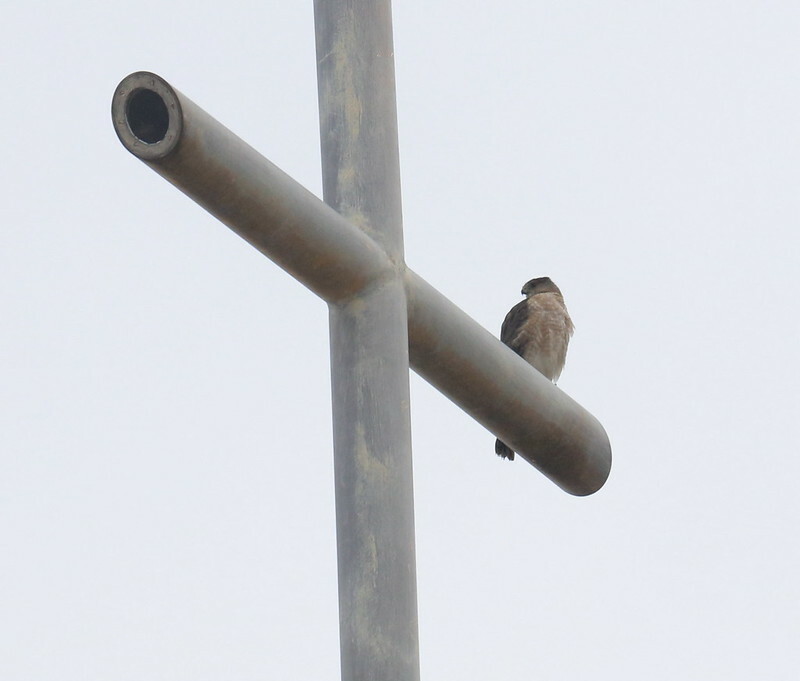 It was interesting that a northern (abieticola) RT that has been around for a few weeks now was also roosting on top of the church at the same time. 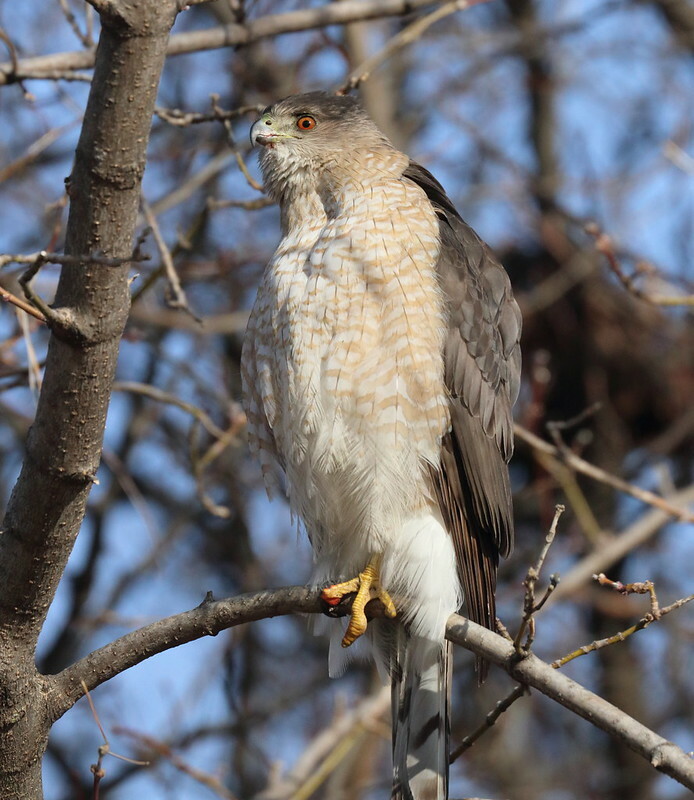 This is an article on a possible Coopers hawk-northern goshawk hybrid. 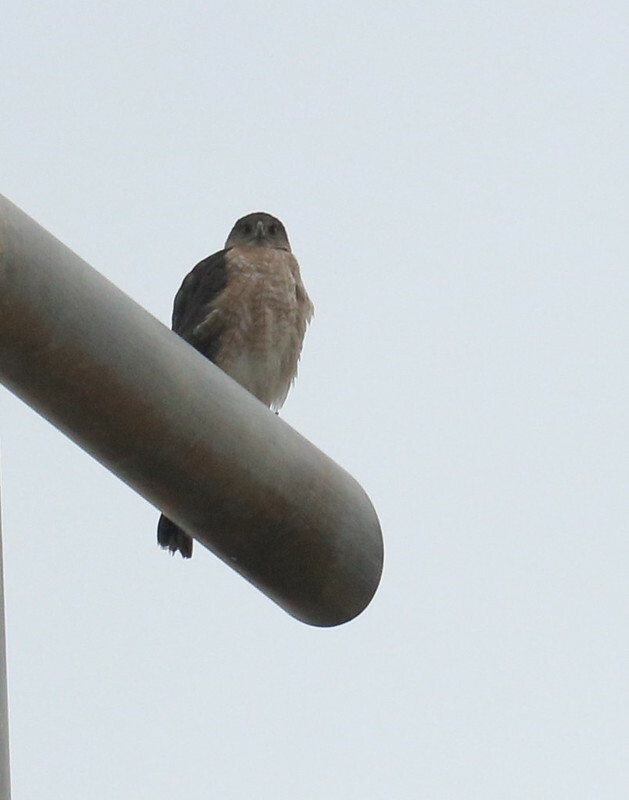 Feb 4 - today at noon I had my first sighting in a while, of an adult Coopers up on top of the church, present for perhaps 10-15min. Mar 11 - this morning I went out to the park at about 6:15 for the first time to look for activity, at about 6:45 I did have a Coopers glide into the park from the west entrance, and glide around eastward for a bit, before turning and heading towards the daycare yard and trees towards the S edge of the park. I couldn't tell if it stopped at all, when I walked over to look I couldn't see anyone in the trees. So I'm not positive if this was one of the residents or not. 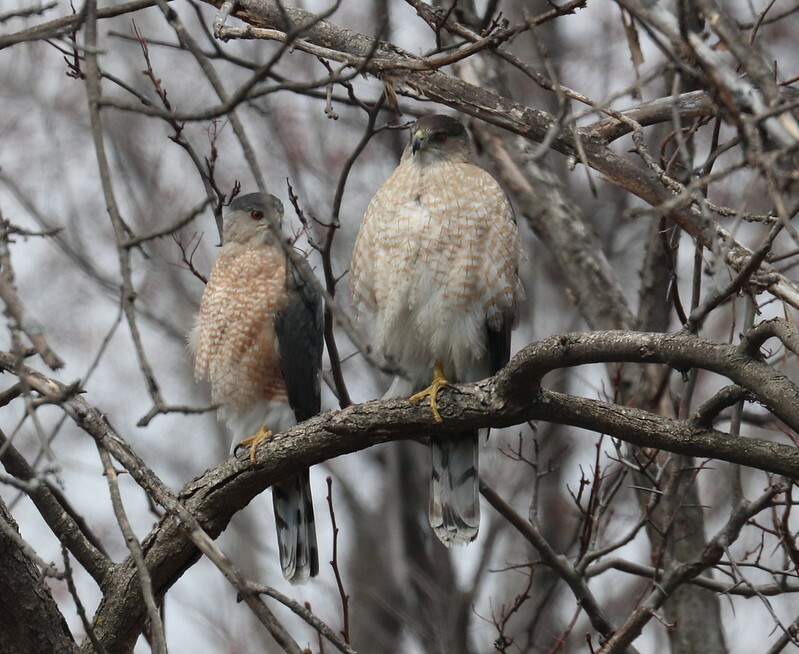 Mar 15 - I went out to the park at ~7am to check on activity, and there was already one Coopers sitting on a tree branch in the area at the S edge of the park, and both adults were present (although I could only hear the other's vocalizations from some where off to the right closer to the building). The visible bird had some type of food, so it's possible there was a delivery. After several minutes there were more vocalizations from the other bird, and the visible one flew off to the right to the park edge and out of sight. Going by the park again around noon time, the female was still sitting in the same area, so this is also a sign of increasing presence in the park over just short pre-dawn activity. At ~6:30pm another check had the female once again roosting around the same area, with the male flying past from the park edge, heading in her direction. He did not appear to stick around, but there were quite a bit of vocalizations. Mar 21 - Both yesterday and today, checking the park when passing by both early in the day (~9:30 am) and late afternoon (around 5:30pm) there was adult presence (female) in the trees in the vicinity of the nest. This is indicating that the female is spending substantial amounts of time in the park area now. Mar 22 - This morning at ~10am, when walking along the sidewalk just off the W entrance of the park, an adult flew low over the road and into the park going past the nest tree and further on, but upon checking there was no sign of either adult in the trees, so it did not stop to roost on this occasion. This evening the park was empty. A recent article on urban accipiters. Mar 24 - I visited the High Park Coopers territory early in the morning to look for courtship activity, and found the adults vocalizing close to last year's nest tree. There was a brief copulation, followed by the female leaving, although periodically she was continuing to vocalize from different locations close by the same stand of trees. I did see the male break off a couple of sticks and fly them up into last year's nest. I saw my local female briefly a little later in the morning, and around noon time after going out, I found an adult up on top of the church north of the park. Mar 25 - my local female was again roosting in the park around the nest area at around 9am. Mar 27 - I was able to check the park fairly early at around 7:15am, and both adults were roosting near the nest, the male did make two or three trips back and forth to break off small sticks and fly them up to the nest during the time I was watching. 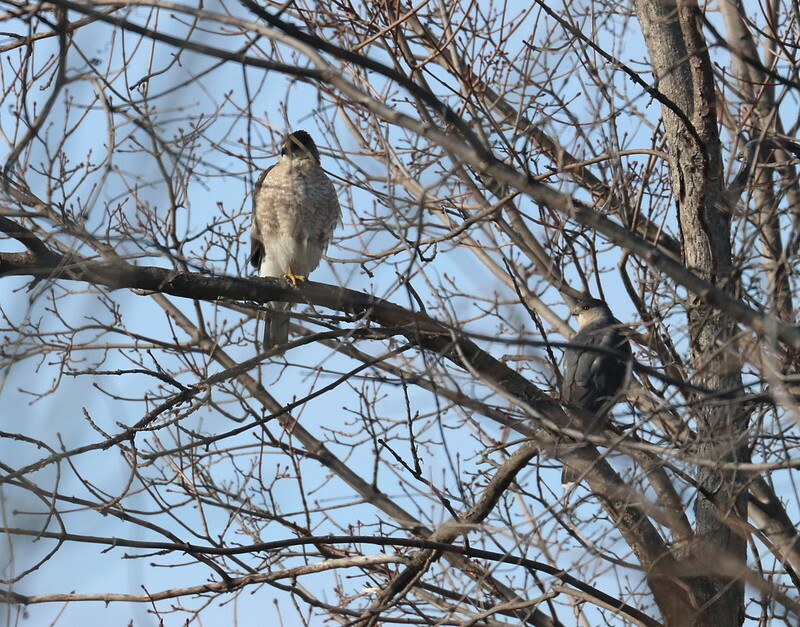 Mar 28 - Around 9am one adult was roosting near the nest, interestingly I spotted another accipiter a few minutes later farther up a block further north from the church, but I don't know whether one of the residents would normally wander up that far. 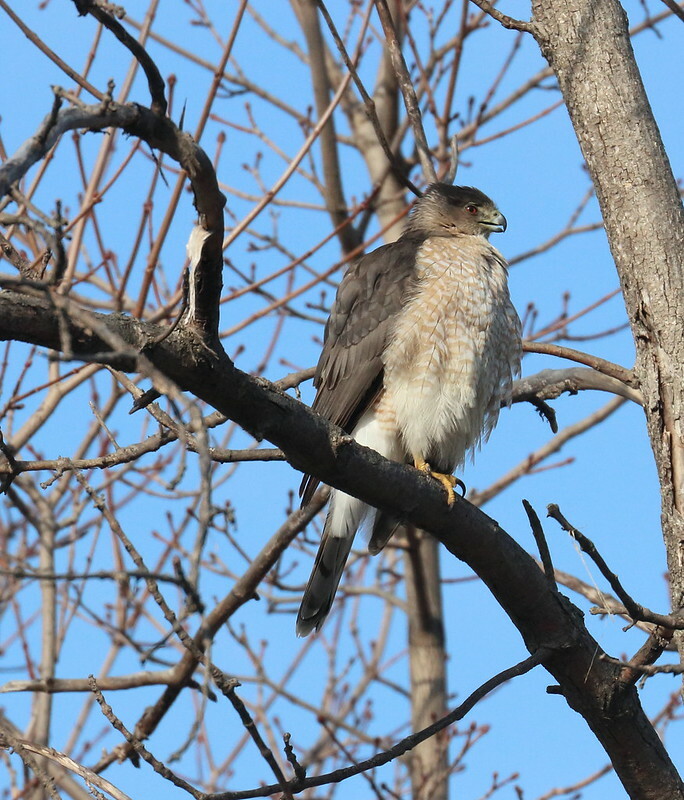 Apr 4 - I went out to the park at about 9:15am, I did not see the female in the typical spots near the nest tree, but then I heard some whaaa vocalizations coming from further back, along the N edge of the park. I found the female roosting fairly low in a branch of the small trees/bushes along the N edge right beside the N walking path exit to the park. 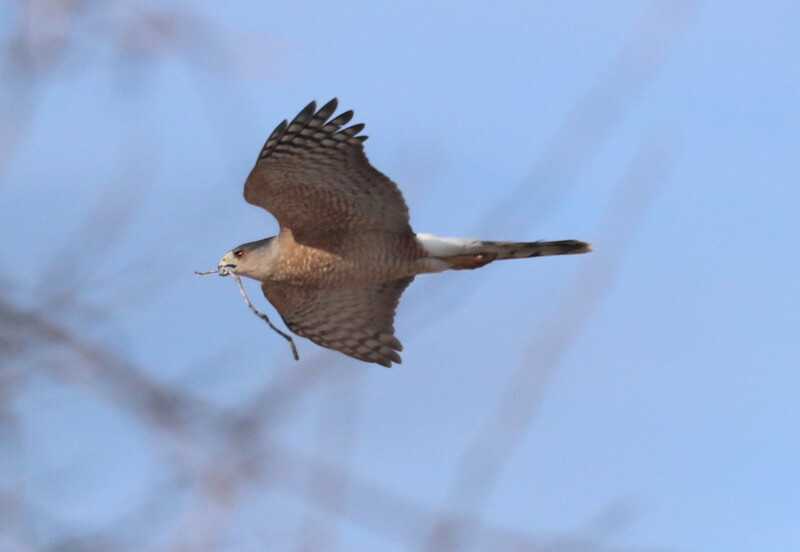 In high resolution it appeared that the female may have eaten recently, as there was some blood on the feet and a bit around the edge of the beak. She continued periodically make whaaa calls which are her typical vocalization when communicating with the male, although he was not anywhere in sight. However she may either have been making calls to request food delivery, or she may have been able to see him somewhere in the distance. However the male did not make an appearance during the period I was there. However the shots of the female also did yield a useful piece of information, the middle toe on the left foot above has somewhat of an unusual/bulbous shape, as if perhaps an old healed fracture or some other injury to the toe. Upon going back and reviewing other shots of the female from last year, this shot from almost exactly a year ago shows the same kind of unusual shape to the middle left toe. This is pretty good confirmation that it is the same resident female in the territory. Apr 6: Going out in the morning around 8am, both adults were in different branches of the nest tree below the nest. I hoped to get close shots of the male especially for identification purposes, but before I could return with my camera the male flew up briefly to the nest, and then flew to one of the usual roosts just away from the nest tree. The female took some interest in a squirrel which was moving around high in the nest tree but did not make any other moves toward it. Apr 16 - I have not been able to check the nest for the prior week, but on checking the nest area in the morning, both male and female were roosting together close to the nest area. The nest structure appears to have been added to visibly. Apr 17 - in mid morning, I caught the female briefly on the nest poking around in the rim before flying back off to the trees.